Alternative names: Kānuka, Mārū, Rauwiri (mainly Kunzea spp. ); Kahikātoa (Leptospermum scoparium). Mānuka rauriki Leucapogon fasciculata (mingimingi). These are followed by references and suggestions for further reading, and acknowledgements. The most widely used names for this group of trees may be derived ultimately from the Proto-Austronesian word root *nuka ("wound"), which gave rise to the Proto-Polynesian plant name *nukanuka, referring to the tree Decaspermum fruticosum (Myrtaceae), related and similar in appearance to the trees called mānuka in Aotearoa. 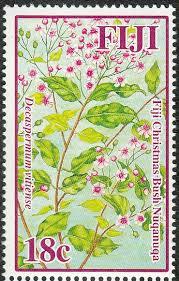 A similar tree, D. vitiense the "Fijian Christmas tree", is found in Fiji, with the cognate name nuqanuqa. The name has been reduced to the basic word root (nuka) in Māori and further modified with the formative prefixes mā- and ka-. The origin of these plant names is discussed in the page about the Proto-Polynesian word root (see the link at the top of this page). Because of the multiplicty of names and overlapping meanings, there are five separate pages in this set: (1) Proto-Polynesian *nukanuka, with its antecedents and reflexes; (2) the Māori word mānuka in its own right (this page); (3) mānuka in the form of members of the genus Kunzea, a.k.a. kānuka; (4) mānuka in the form of varieties of the species Leptospermum scoparium, a.k.a. kahikātoa; (5) mānuka rauriki in the form of Leucopogon fasciculata, a.k.a. mingimingi (mānuka rauriki is also an alternative name for some of the Kunzea species). In Taitokerau (Northland), mānuka is the preferred name for Kunzea species; elsewhere these are most commonly referred to as kānuka. When there is a need to refer explicitly to Leptospermum scoparium plants, kahikātoa is the preferred Northern term, and mānuka has this function elsewhere. This page deals pimarily with the word mānuka; the plants to which it refers are discussed in more detail in the pages for kānuka (Kunzea ericoides s.l.) and kahikātoa (the New Zealand variants of Leptospermum scoparium s.l.). (The abbreviation s.l. by the way, denotes sensu lato, "in a broad sense"; i.e. broadly speaking, as against s.s. sensu stricto "in a concise sense", i.e. strictly speaking, so in this context Kunzea ericoides s.l. can be interpreted as meaning "the groups of related plants that used to be labelled collectively as Kunzea ericoides", and Kunzea ericoides s.s. as "the plants now classified as Kunzea ericoides". If you follow the link to Kānuka, you will find the difference explained. You can tell the Kunzea from the Leptospermum species apart by the larger flowers of the latter, and their slightly larger leaves which are also more pointed and prickly than those of the Kunzea species. If you have a microscope (or a very powerful magnifying glass) handy you can separate out the kānuka (Kunzea) from the kahikātoa (Leptospermum) species of mānuka by investigating the margins of the leaves. 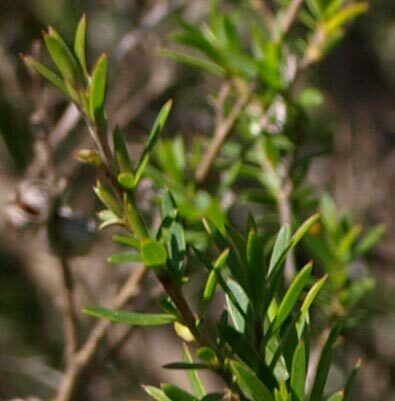 The botanist Rhys Gardiner discovered that the apparently smooth leaf edges of the Leptospermum leaves had minute serrations, although these were only visible at magnifications of x10 or higher. The Kunzea leaf margins on the other hand were smooth, even at this magnification. Furthermore, when the soft tissues was dissolved to expose the veins, he found that the arrangement of the veins in the Leptospermum leaves was symetrical and the veins converged right at the tips of the leaves (which helps to explain their strongly aromatic quality). The veins in the Kunzea on the other hand were tangled, and did not reach right to the leaf tip. 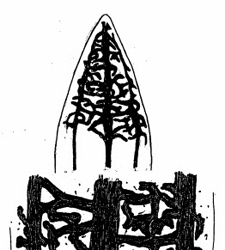 Portions of the sketches illustrating his paper "Notes towards an excursion flora" (2002) are reproduced below. Leaf tip of Leptospermum scoparium, showing symetrical arrangement of the veins, extending to leaf tip, and minute serrations on the leaf edges. Leaf tip of Kunzea sp. 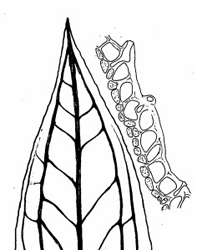 (Kānuka), showing the smooth leaf edges and the tangled arrangement of the veins, which do not reach right to the leaf tip. Is Mānuka (still) a Māori word? Forms: 18 manook, 18 manouka, 18 manuca, 18 manukau, 18 menuka, 18 minuka, 18– manuka. Also with capital initial. Origin: A borrowing from Maori. Etymon: Maori mānuka. Etymology: < Maori mānuka, denoting both red manuka and white manuka (the latter is also called mānuka rauriki). Either of two evergreen Australasian shrubs or small trees of the family Myrtaceae, with very hard, dark, close-grained wood and with leaves which are sometimes used as a substitute for tea: (a) (more fully red manuka) Leptospermum scoparium, with reddish wood, found in Australia as well as New Zealand (also called red tea-tree); (b) (more fully white manuka) Kunzea ericoides, with small white flowers, endemic to New Zealand (also called kanuka, white tea-tree). Also: the wood of such a plant; scrub composed of such plants. Frequently attributive. c1826–7 J. BOULTBEE Jrnl. of Rambler (1986) 110 Tea tree bush—mánook. 1832 London Med. Gaz. 18 Feb. 750/1 This tree..is probably a species of Leptospermum. It is found abundantly at New Zealand,..and is named Kaeta~towa, or Manuka, by the natives. 1840 J. S. POLACK Manners & Customs New Zealanders II. 258 This wood, called by the southern tribes Mánuka, is remarkably hard and durable. (The citation from Pollack is taken from his description of the kahikātoa). The word ranked well above "Band 3" in its frequency in the Māori-language newspapers published between around 1840 and 1920, making the first of several hundred press appearances in Te Karere o Nui Tireni for 1 August 1842 (Vol. 1, No. 8, p. 31) in an account of the apprehension of a chicken thief "i nga huruhuru neke atu ko te hutinga i roto i te manuka" [among the scrub heading for a clearing in the mānuka]. The Oxford dictionary unequivocally affirms the word's New Zealand origin, and its presence in English as a borrowing from Māori. What is borrowed clearly is not owned by the borrower; its presence in English is thus as a loan, not an acquisition severed permanently from its homeland and language of origin. 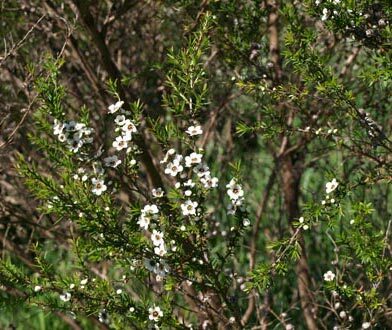 It should be noted too that in relation to Leptospermum scoparium s.l., the word refers only to New Zealand plants currently included in this species. The New Zealand varieties of Leptospermum scoparium are not identical with the Australian ones; even some South Island plants which are similar to a Tasmanian strain differ from the latter in having wider leaf bases and more pungent leaf tips than their Tasmanian counterparts, and, very importantly, they lack the lignotubers (woody growths around the base of the tree, from which new growth can emerge after the top of the plant is damaged) which the Tasmanian plants have developed as a defence against fire. 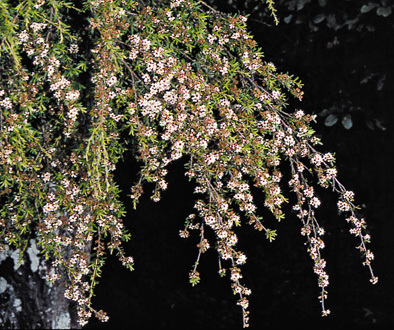 It is probable that more research will establish not only that the New Zealand Leptospermum varieties constitute together at least a single endemic species, with several variants, including the currently named Leptospermum scoparium var. incanum; but, as with the Kunzea ericoides complex, may eventually justify their subdivision into several distinct species. The key point is that it is already clear that all varieties of Leptospermum native to Aotearoa are endemic (unique to this country). it becomes "Go to Your-broken-ears to eat the seeds of trouble" ~ that is, ignore what you've been told at your peril! Whakapūpūtia mai ō mānuka kia kore ai e whati. that is, "Beware of those formidable foes who will be lying in wait for you". Ki te ahi mānuka, ē.
ii. the word “honey” which is a prescribed name under standard 2.8.2 of the Australia New Zealand Food Standards Code. b. The Trade Mark is not capable of distinguishing goods in respect of geographical origin as manuka honey can be produced outside of New Zealand. c. The Trade Mark is not capable of distinguishing goods in respect of composition. a. manuka honey only comes from New Zealand, when this is not the case. b. there are firm or meaningful criteria against which the Applicant has certified or can certify goods, when this is not the case. The Australian assertion is substantially without merit, and it is to be hoped that it will be dismissed by the Australian authorities. 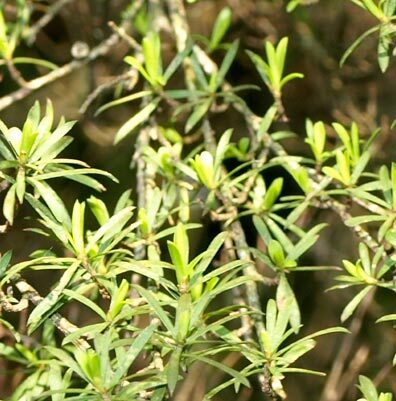 As noted in the previous sections and on the page dealing with the history of this plant name, mānuka is not only a uniquely Māori word, but it also applies only to New Zealand varieties of Leptospermum scoparium s.l., and therefore genuine Mānuka honey is a uniquely New Zealand product. The way the honey is produced also ensures that it is certified in a way that ensures geographic and compositional integrity. Grading of genuine mānuka honey is done by means of determining the presence of the Unique Manuka Factor (UMF) in the honey and assigning a UMF number ranking its strength. This number represents the unique signature compounds characteristic of this honey which ensure purity and quality. These include: the key markers of Leptosperin, DHA and Methylglyoxal. Honey produced from NZ mānuka honey was known to possess certain anti-bacterial and healing properties above and beyond those of other kinds of honey, but the source of these properties evaded discovery until breakthrough research by German scientists isolated the presence of the compound methylgloxal (MG) in the honey. It was then found that this is the result of the presence of the compound dihydroxyacetone (DHA) in the nectar of New Zealand plants of Leptospermum scoparium. (Follow the links above for more information). Leptosperin is a naturally occurring chemical, found only in the nectar of Manuka plants (and a few very close relatives). Its presence in addition to the DHA and Methylgloxal helps assure the authenticity of honey labelled as "mānuka". A few other species of Leptospermum (by no means all) may express leptosperin in their nectar, but these are not grown in New Zealand and so are irrelevant in respect of mānuka honey. It is possible that some New Zealand Kunzea plants may also have minute traces of leptosperin in their nectar (although the evidence for this is weak), but in quantities so small that it would be below the minimum level on the UMF scale. It is to be hoped that the Australian authorities will agree that the origin and meaning of the word "Mānuka" would make its application to Leptospermum (or any other) honey produced outside New Zealand misleading, deceptive and indeed fraudulent. References and further reading: See the linked pages and publications referred to above; also the general works on NZ trees in the bibliography. Photographs: The photograph of Kunzea robusta in flower is by (c) Jeremy Rolfe, NZCN, and the diagrams of the leaf tips are from the paper by Rhys Gardner (see link above). The other photographs are by RB (Te Māra Reo).